In the midst of the hustle and bustle of the season, I’m taking a little time out for some advent fun. 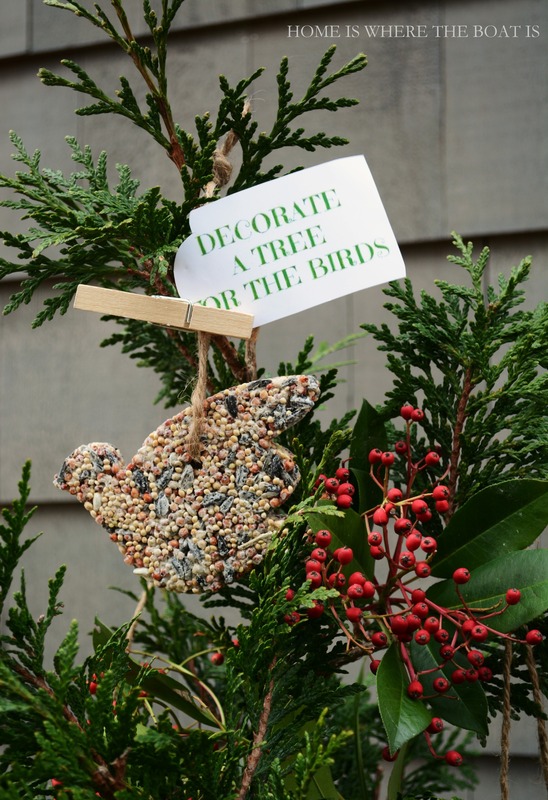 I decorated a tree for the birds with bird seed treats, an easy and fun project that kids would enjoy, along with your feathered friends! My inspiration took flight from my Birds of a Feather Advent Calendar. I’m nesting by my Potting Shed with some bird seed treats that I hung on a small potted tree. 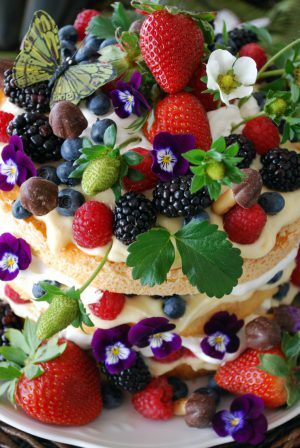 I added some berries I cut for decoration along with some orange cups, halved and filled with seed. Mix flour, water, gelatin and corn syrup in a large mixing bowl. Stir until well-combined. Stir in birdseed, coating the seed with the flour mixture. Spray cookie cutters/molds with nonstick spray. Spoon the birdseed mixture into each mold, making it flat as possible on top, pressing down with the back of a spoon. Using a drinking straw, poke a hole through the center near the top of each birdseed mold, making sure it goes all the way through, leaving the straw in until the mixture is set. 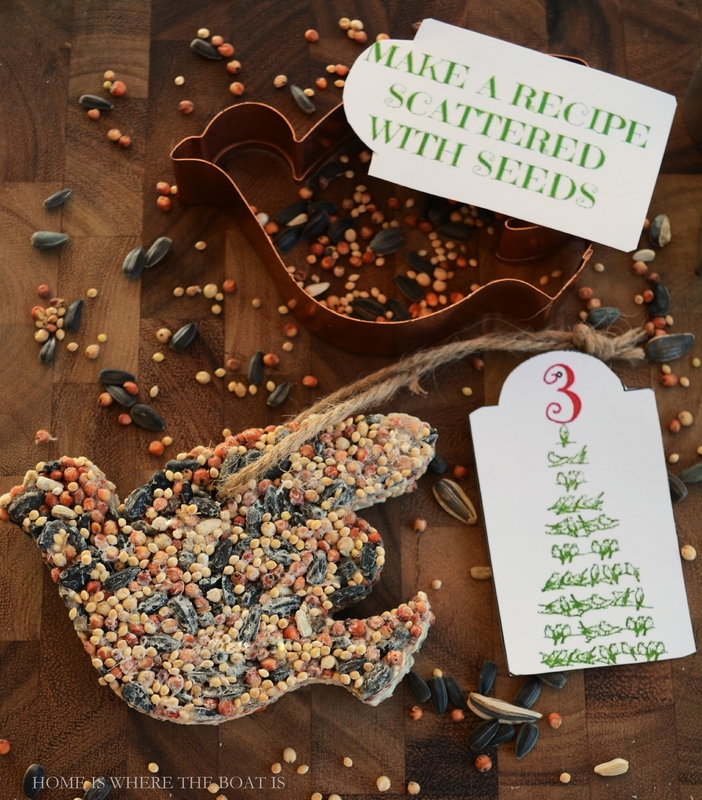 Leave the birdseed mixture inside the molds for 2 – 3 hours. Remove the birdseed mixture from the molds and gently place them upside down on the waxed paper. Allow them to continue to dry overnight. 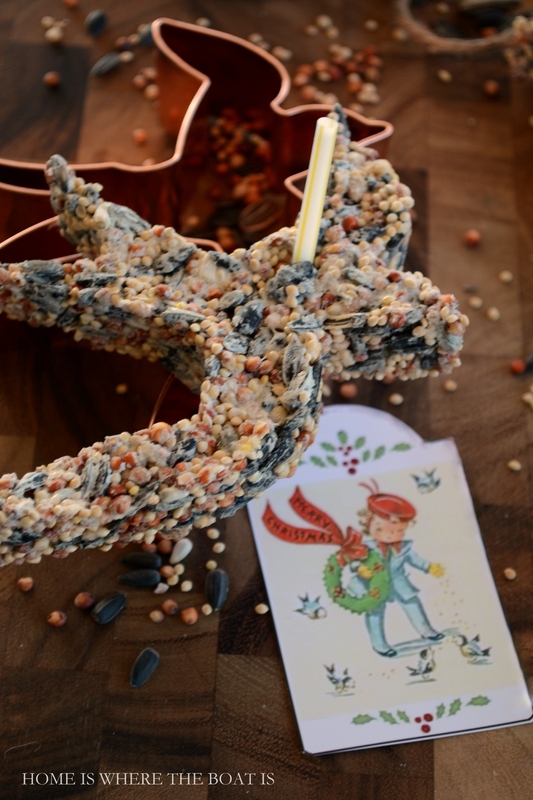 Using twine or ribbon, carefully thread it through the hole of your treats, tie and hang on a tree branch! We keep our feeders filled year round, but it is especially important when temperatures drop, days are shorter and when there’s snow on the ground. 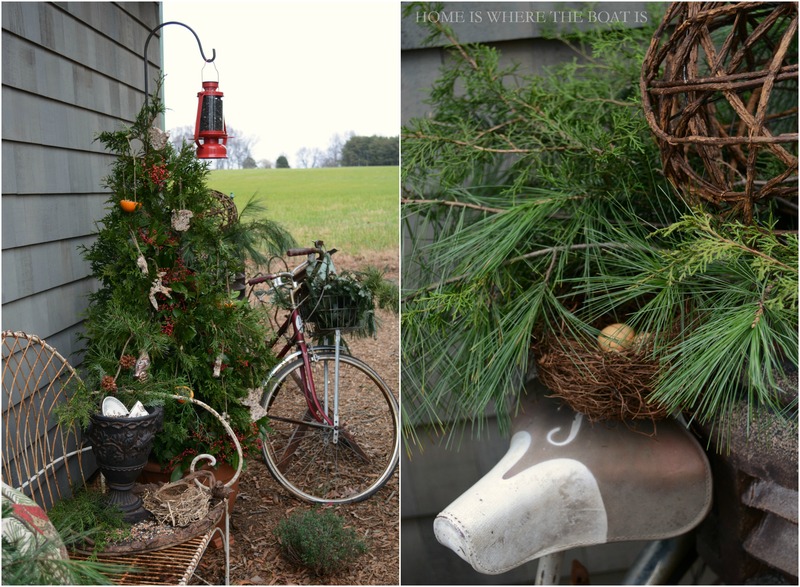 A bird house, greenery and pine cones, along with a bird ornament have come home to roost in the basket of a vintage Schwinn Breeze, replacing the gourds and pumpkins this fall. 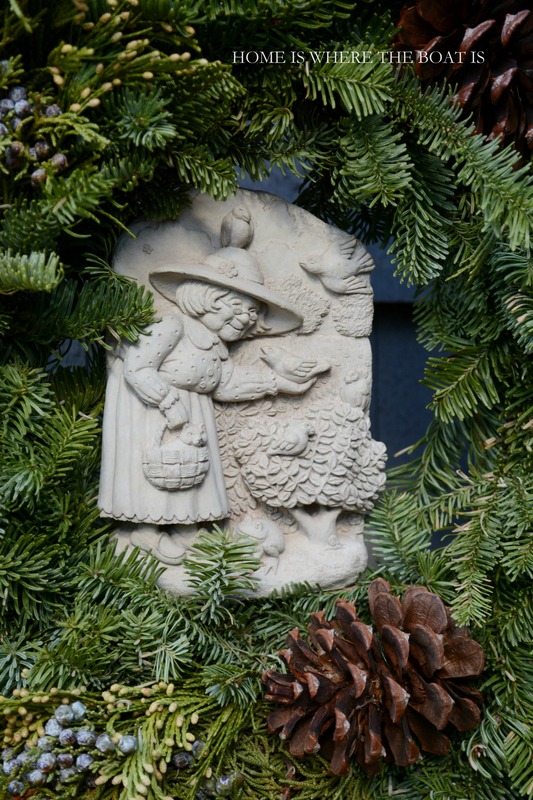 And a Carruth Studio plaque of a lady feeding the birds is framed by an evergreen wreath. 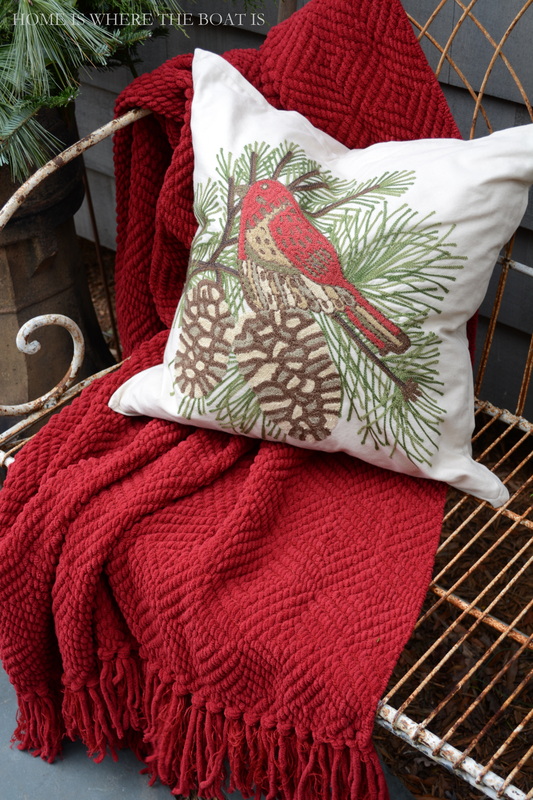 Hope you’re taking some time out to feather your nest and savor the season! Totally loved the bird ornaments. Its a great idea to get kids involved and also give sweet treats to our feathered friends. Just adored the cup and saucer in the flower pot container. Thanks for sharing such sweet ideas. charming, as usual…Where did you find the great lantern bird feeder? My husband wants another bird feeder for the window outside his shop and that one would be just right. Thanks for all your wonderful ideas. Everything is just lovely!! You have such creative ideas and such an eye for composition. Your photographs are just beautiful! Love the sweet orange cups and the cookie cutter seed molds. Thanks for the recipe, too! 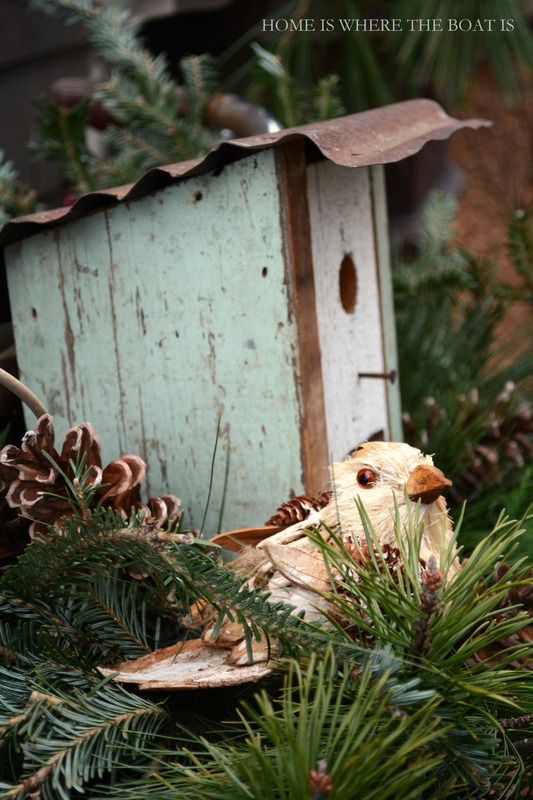 Birds must flock to your potting shed Mary, so many wonderful places to perch and to munch! You are having a lot of Advent calender fun, and I’m sure your feathered friends are very appreciative! 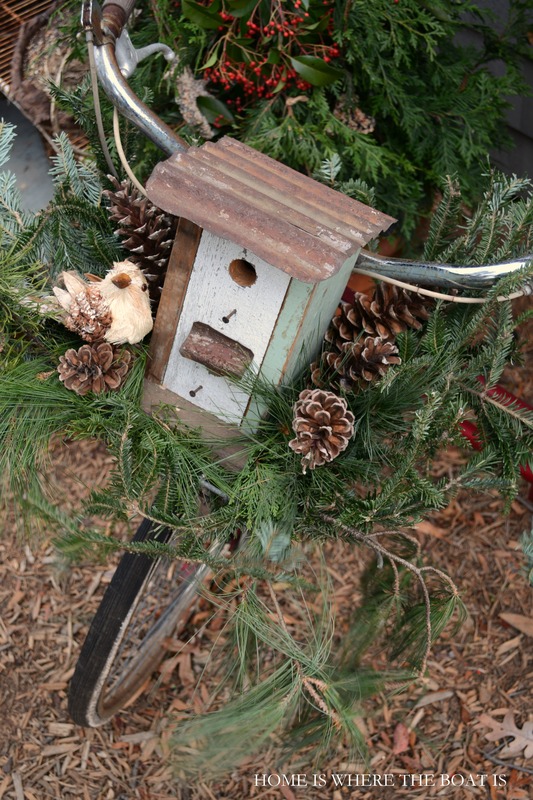 The seed cookies and oranges are too cute!I love the way you have decorated the bike with the birdhouse “headlight” and the rake full of pine cones! Looks great & I’m sure the birds are happy. Not sure if I left a comment previously, but Sur la Table has an awesome bird tea towel that looks kind of like last year’s Pottery Barn bags that reminds me of you. What a great post. Photos are spectacular as usual. I’m also a bird lover, I’ll be pinning this for the future. Just love your special Advent calendar! And…the not quite self-portrait ornament is AWESOME!!! 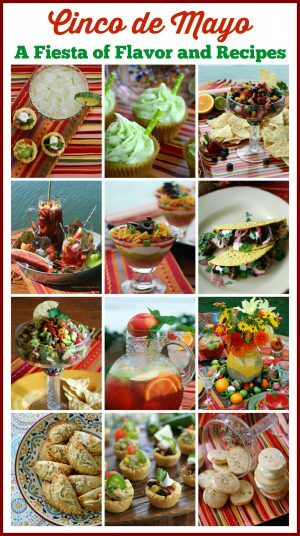 Thanks for all the beautiful ideas and great recipe instructions. Your pics are magnificent! 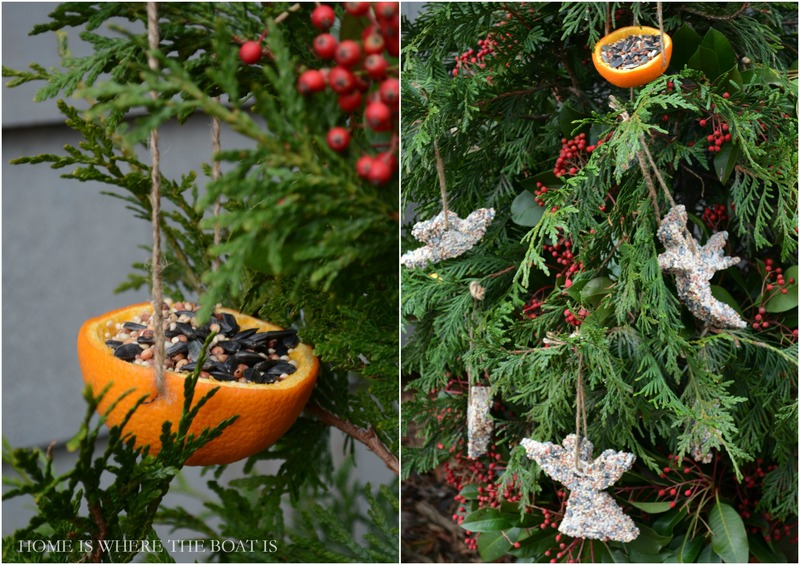 Love the bird feeding ornaments! It is so needed in snowy cold weather. Thanks for sharing! What a fun and simple project! Your bicycle looks lovely! We make sure our feeder stays full in the deep winter too, so many colorful birds to enjoy here in the mountains. I know the birdies are happy at your home, Mary! Thanks for the recipe for treats for our feathered friends. I love your birdie teacup and saucer and your pretty pillow. I was going to ask about the lantern feeder too, I will be SCURRYING to Lowes ASAP to get one for Joe! It looks like a railrroad lantern so he will LOVE it!!! You exhaust me trying to keep up with all you do! This is such a treat to see! 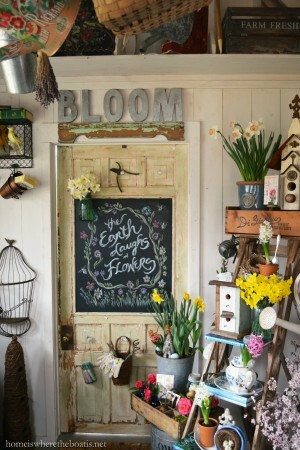 I have potting shed envy BIG TIME!!!! 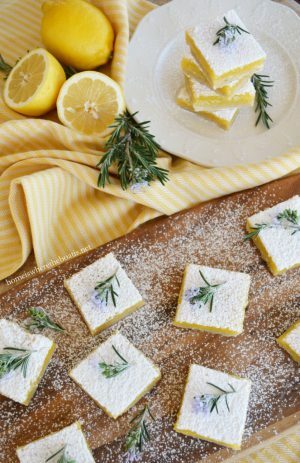 The birds will be oh so happy to find these delicious treats. I hope the squirrels don’t get there first! Like you, I’m finding the days flying by all too fast, but that seems to be the way of things these days. Just beautiful, Mary. The days may be taking wing, but your magic is abundant and everywhere. one year as gifts for garden club members. 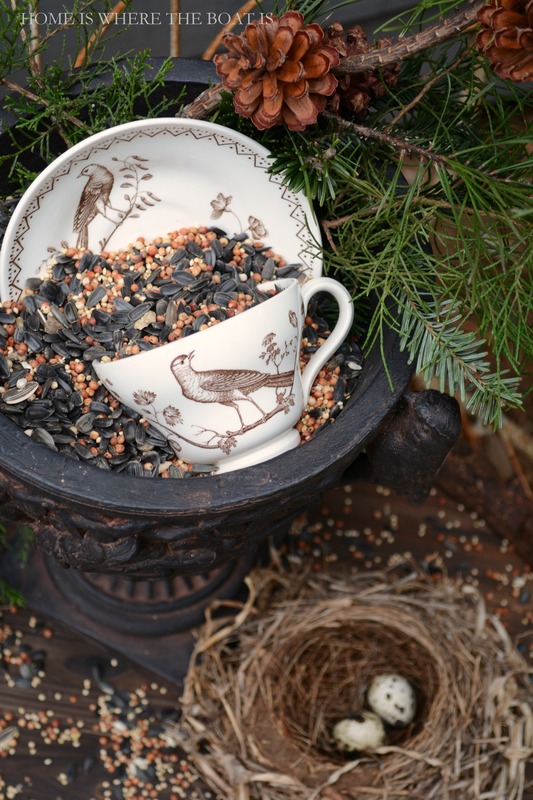 Love your potting shed and all your sweet bird things. 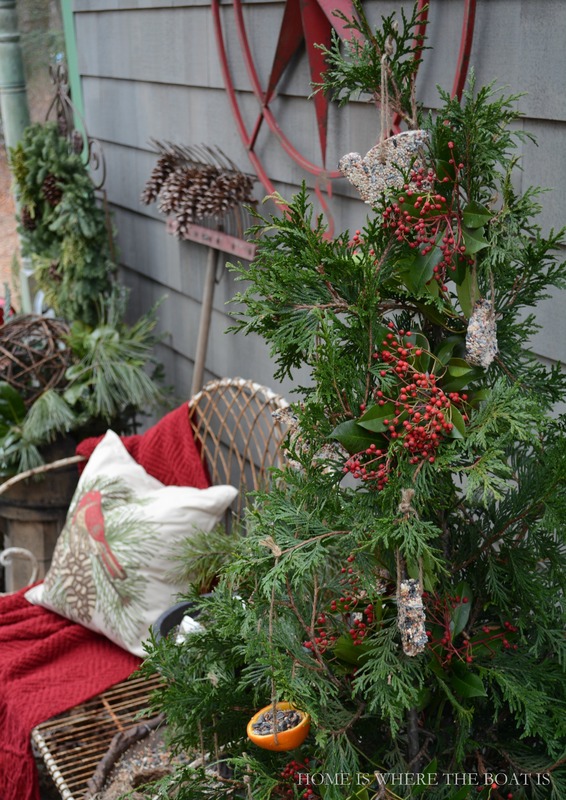 love your tree and the lantern bird feeder! That is adorable….please share where you found it! I make my own bird treats too Mary, but never with a cookie cutter mold. Thanks for the great idea. Every picture is one I could stare at all day! We all appreciate your talent and are all “birds of a feather, who flock together” – to your blog! I absolutely love everything you do!! Thank you so much for loads of inspiration. 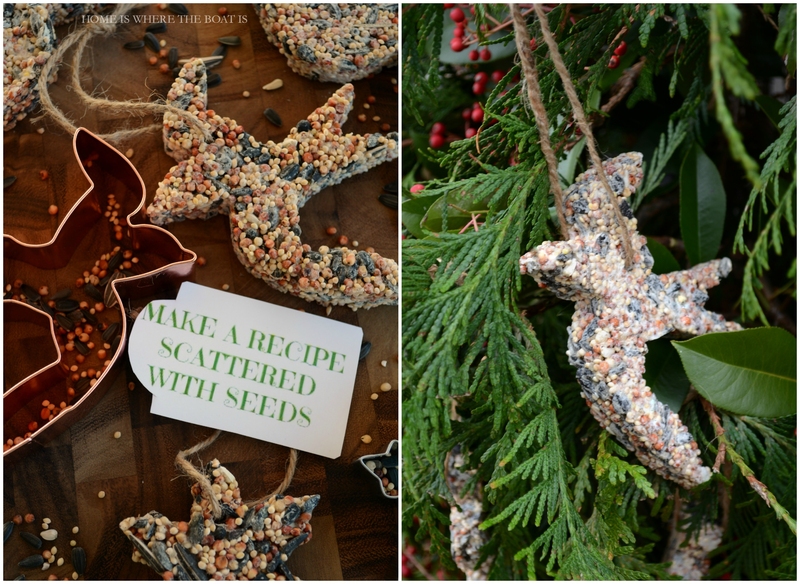 I love the bird seed ornaments. Seems they would stay together better than using lard or suet which tends to melt when it gets the least bit warm here in the piney woods of east Texas. 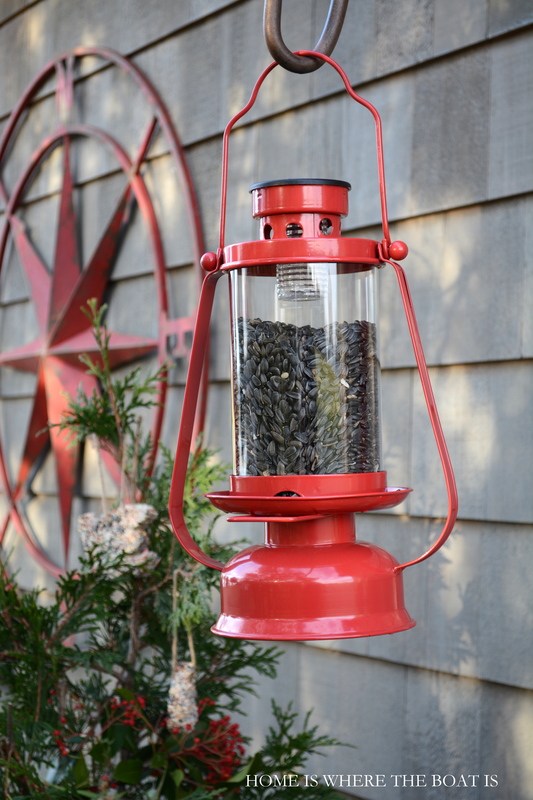 Where or where did you get the red lantern bird feeder? Charming!! This would keep you busy and the birds fed. Our new neighbors are really going to town on those bushes. 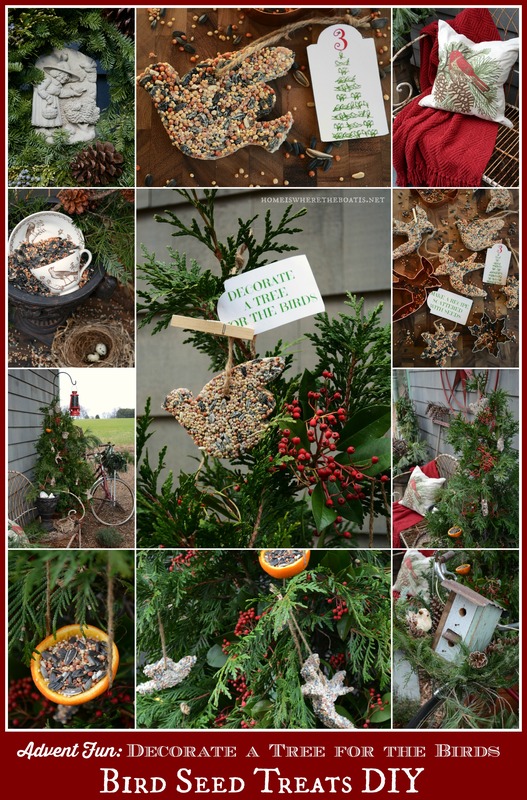 Love the bird seed tree!…and the birds are loving you!…Just love all of the pretties around the garden shed and that Birds of a Feather Advent Calendar is the cutest!!! 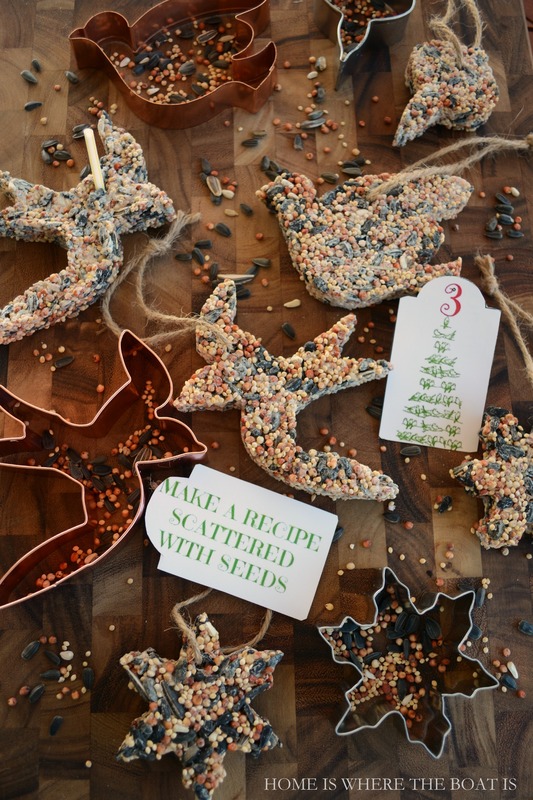 Mary: Love the bird seed ornaments! I made several to go on top of a present for my sister-in-law (a bird feeder). She loved the ornaments (and so did my birds). Thanks for posting. I am new to your blog. Glad I found it. Love it all! 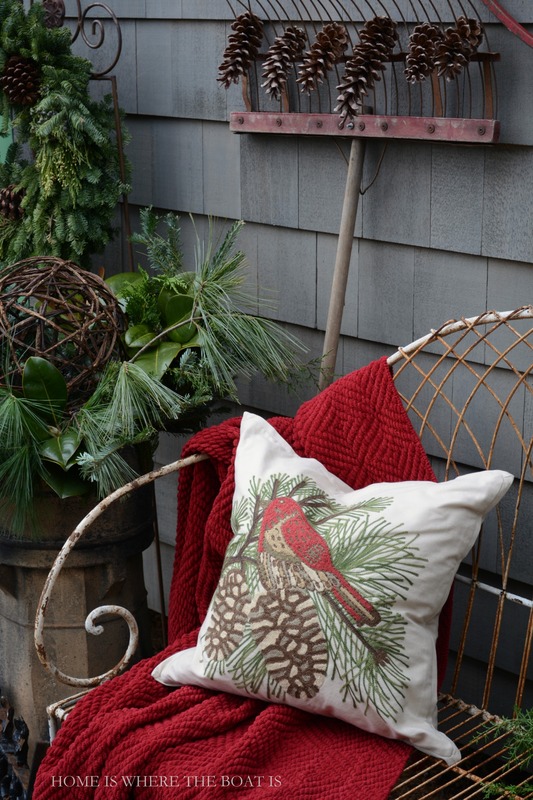 Do you remember where you got the red throw and bird pillow? I must say selfishly that I do not share with my co-workers where my great ideas come from- YOU! I am the oldest person in the building so I need some kind of leg up. I worked many years doing two full time jobs (one was Nordstrom customer service for 15 years) putting my four wonderful kids through college. Now I wait for your email and try to emulate most your ideas. 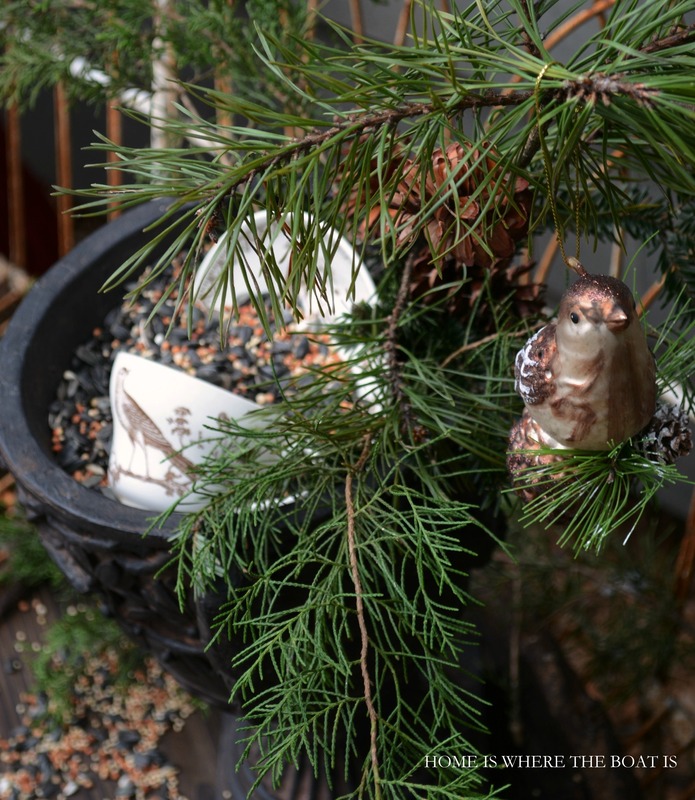 My grandchildren and I will be building a bird tree this Christmas. Thanks for always making my day!!!! ps your mother in law is in our prayers. Back for seconds, such a sweet post. 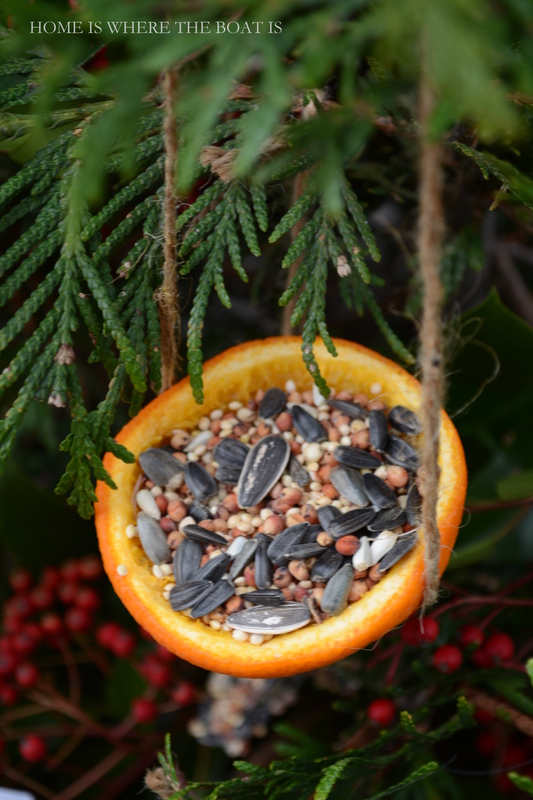 You have inspired an after Christmas get together with a group of friends to make treats for our feathered friends. I have related what you posted about long dark cold nights and the need for food, suet and water and the gals were more than happy to do this project. Thanks for all your lovely posts, cant get enough!! 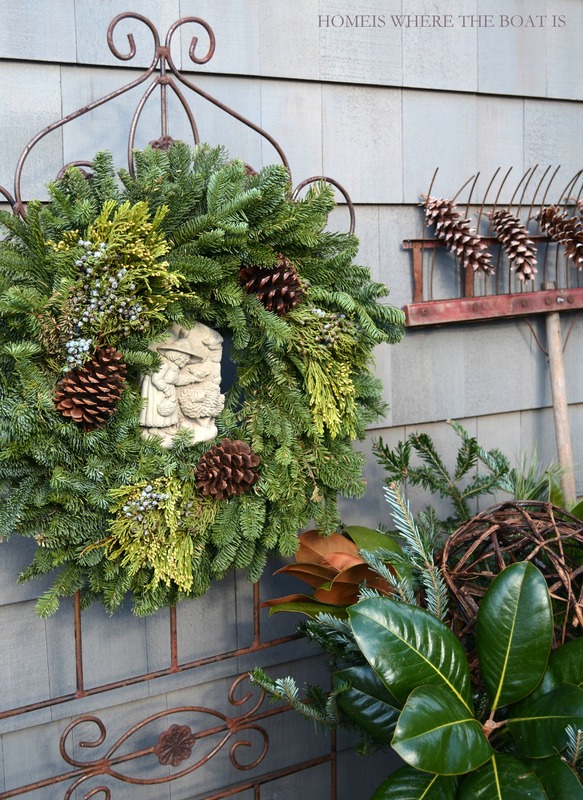 Love the bird feeder…running to Lowes tomorrow …..where did you find the bird cookie cutters …. The cookie cutters came from HomeGoods and Sur la Table. My bird seed treats are not getting hard enough what could I be doing wrong?